Sunny, along with a few afternoon clouds. A stray shower or thunderstorm is possible. High 83F. Winds SSW at 5 to 10 mph..
A mostly clear sky. A stray shower or thunderstorm is possible. Low 59F. Winds ESE at 5 to 10 mph. The Foresthill Public Utility District received the District Transparency Certificate of Excellence by the Special District Leadership Foundation (SDLF) in recognition of its outstanding efforts to promote transparency and good governance. “This award is a testament to Foresthill Public Utility District’s commitment to open government,” said Helen Rogers West, President. “The entire district staff is to be commended for their contributions that empower the public with information and facilitate engagement and oversight.” To receive the award, a special district must demonstrate the completion of essential governance transparency requirements, including conducting ethics training for all board members, properly conducting open and public meetings, and filing financial transactions and compensation reports to the State Controller in a timely manner. 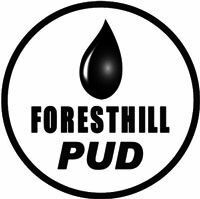 The Foresthill Public Utility District's service area comprises the unincorporated community of Foresthill, California, located in Placer County approximately 60 miles northeast of Sacramento. The District currently incorporates an area of approximately 13,000 acres and contains primarily residential development. The District as of June 1, 2018 provides 1,979 water service connections. It is the mission of Foresthill Public Utility District to provide the Community of Foresthill with the highest quality drinking water at affordable rates with courteous and professional service; To manage District resources responsibly for future generations.